A simple project on measurement and literacy at Regency Acres Public School has snowballed into a movement – a movement which, if students have their way, will go to the dogs. 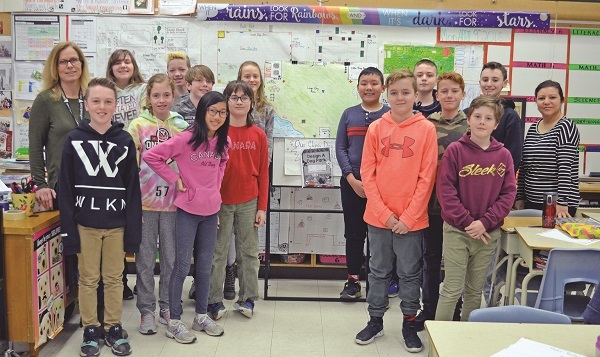 While many of the features in the 21 acre piece of parkland that will form the centrepiece of the Highland Gate redevelopment have already been settled, students in Norma Moffitt’s Grade 6 class have other ideas and are preparing to take their idea to the individuals who can make it happen. Their idea? A new dog park to serve Aurora’s west side. So far, Aurora’s only leash-free dog park, Canine Commons, lies near the top of Industrial Parkway North. Students say it is next to impossible for them to take their dogs over there without loading up their parents’ cars, leading not only to pollution but a lost opportunity to get youth up on their feet and leading healthy lifestyles. Working on their upcoming pitch to Council, the students Bryce Lamontagne, Tiffany Kazinczi, Zach Henderson, Lily Zapata, and Brad Gardiner outline a number of proposed amenities in the park to keep dogs happy, healthy and stimulated, and, in turn that will help the Town or other stakeholders turn a profit. “The class started a project and assignment on an idea designing a dog park for measurement and literacy, but then it snowballed,” explains Ms. Moffitt, noting that, through the process and consultation with Councillor Sandra Humfryes, kids have developed a passion for having their voices heard by their leaders.